This Saturday police departments around New Jersey are opening their doors as part of Operation Medicine Cabinet, a program in which people can drop off unwanted or expired prescription drugs. The program is being done in conjunction with the Partnership for a Drug-Free New Jersey. Hopefully this program will help solve two problems: the problems of prescription drug abuse (which you can determine with a home drug test) and the pollution problem caused by dumping prescription drugs. The Philadelphia Inquirer gives us some details on the latter: traces of over 56 prescription drugs and/or byproducts were discovered in the city's tap water last year. Operation Medicine Cabinet has a great website. Click around for some interesting facts, for example that between 1995 and 2005 treatment admissions for prescription drug abuse increased by 300 percent! The two main categories of abused drugs are tranquilizers like benzodiazepines and narcotic painkillers. 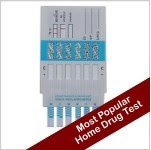 The first you can test for by purchasing a reliable Xanax Drug Test. This test will give you results for any drug in the benzodiazepine family, Xanax simply being one of the best known of those drugs. Meanwhile our Vicodin Test will target any oxycodone based painkiller, and also hydrocodone (Vicodin). This is a good home drug test for parents to consider if they are worried about drug abuse, since nearly 10% of 12th graders nationally have abused it. One of the primary reasons prescription drug abuse has spread, especially among teens, is that the drugs are so easy to come by. 70% of abusers obtain their painkillers from bottles prescribed to relatives or acquaintances. The medicine cabinet is the source - the drug dealer if you will. You may not always be able to tell if someone has taken a pill from your prescription - but you can with a home drug test for prescription drugs - identify the drug you want to test for on our page and choose from our selection of tests.